Hot cross buns! Hot cross buns! 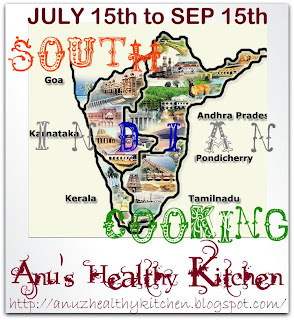 :) Well yes, I have spread my wings a little deeper into baking with yeast! And this time the experiment was Stuffed Buns. The city of Bangalore is dotted with several little Iyengar Bakeries selling varieties of baked goodies from pastries to puffs to cookies to cakes. 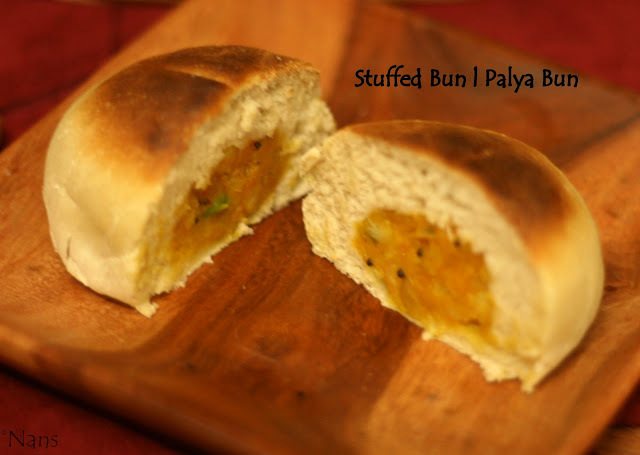 One particular goodie that I was introduced to by my hubby, who is also very fond of this, is the Stuffed Bun or the Palya Bun as it is locally called. 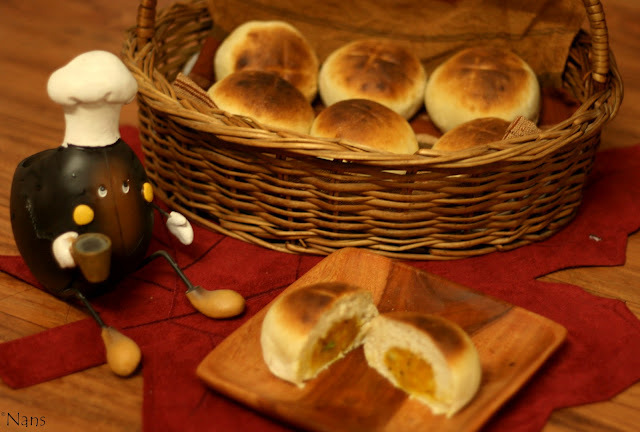 It is the humble sweet bun stuffed with a simple filling of mashed potato preparation. By default, a Palya Bun made its way to our home, after our every visit to the bakery! 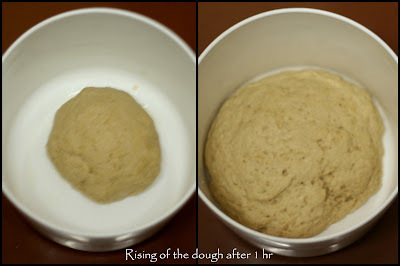 You may want to check this post : How to make Yeast Dough? In warm water, add sugar, yeast and oil. Mix well till yeast dissolves completely. The solution should begin to froth up and bubbles should appear on top. 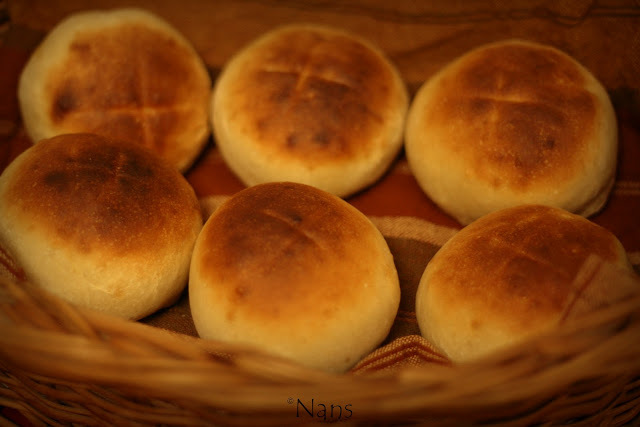 If this does not happen, start from scratch as this step is crucial in the baking of these buns. If using Instant Yeast, proofing is not needed and the yeast can be directly added into the flour. However, to be on the safer side and to avoid disappointment it is always better to proof it as it only takes a few minutes. In mildly warm water, add sugar and yeast. Allow to sit for 4-5 minutes. The solution should begin to froth up and bubbles should appear on top. Mix together APF, Wheat flour, salt, oil, proofed yeast mix. Add extra water or flour as needed to make a firm, yet slightly sticky dough. Keep this dough in a well greased bowl, undisturbed for about an hour or hour and a half, covered with a damp cloth or with cling wrap. Meanwhile, heat oil in a pan. Add mustard and once they platter add the onions and allow to caramelize. Once they turn lightly brown, add the green peas, salt, red chilly powder and turmeric powder. Mix well. Now add the boiled, mashed potatoes and mix all the ingredients well. Switch off the stove and allow the preparation to cool. After about an hour or hour and a half, the dough would have doubled in quantity. Make even sized balls out of the dough mix and place on greases baking tray and keep aside for another 10-15 minutes. 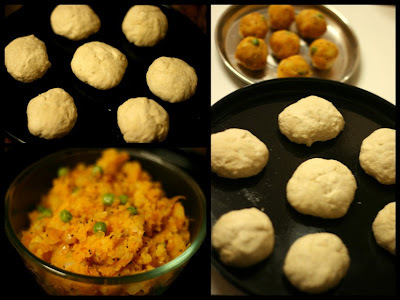 Make mall balls out of the potato mixture as well, about half the size of the dough balls. Now, take each dough ball in hand (grease your hands slightly before taking the dough ball in hand), make a dent in the middle by pressing it down with the other hand, place the potato ball in the center and envelope it by closing in the dough mixture from all sides. Completely seal the potato mixture inside, gently pat the dough ball to flatten it a bit, and place it fold side down in the baking tray. Repeat this procedure for all the dough balls. Mark crosses on top with a knife, if you want pretty 'X' marking on them :) and pat in some olive oil. 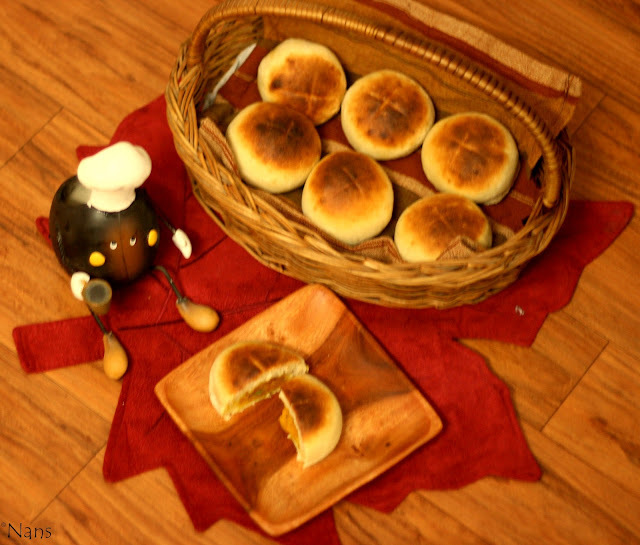 Preheat the oven to 170C and bake these buns for about 8-12 minutes or until the crust start to get golden brown. Take them out and gently brush olive oil or butter on top to give a gloss and to soften them a little. 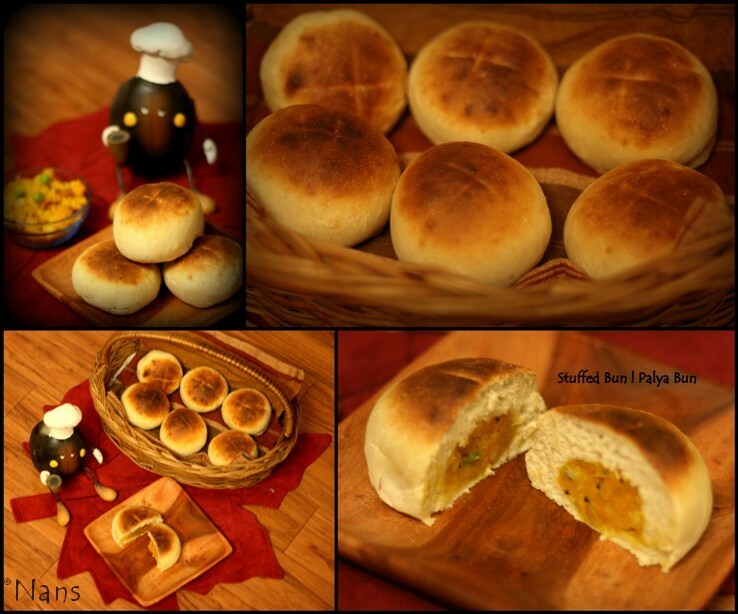 The same bun-recipe can be used to make plain buns as well, or stuffed buns with any other filling of your choice. 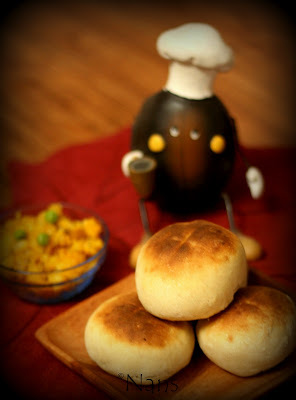 Nan.. these are super:)) I make these with minced meat, but looking at your post; I think its time to make them with loads of veggies!! Delicious!!! !Reminds me of Iyengar bakery in Chennai.Can i use the OTG to bake or in the microwave?Never tried before but your presentation is encouraging. 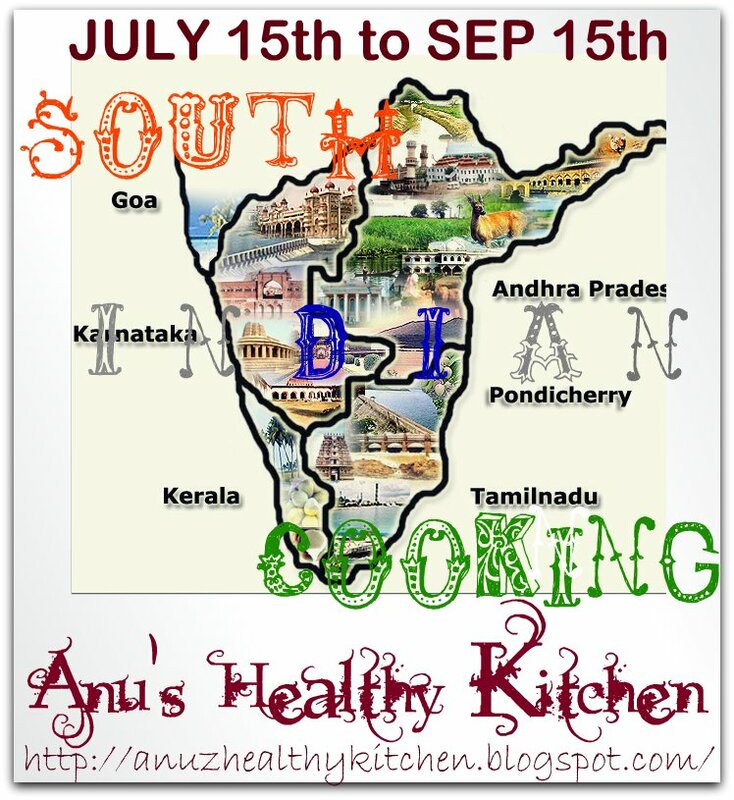 Your blog,this BUN of Iyengar Bakery worked wonders in my shopping.Happy Owner of a MW Panasonic,my first try was your post.I cant thank you enough for the guidance in making of this tea time snack.How can i share this success of mine with a Proof of UPLOAD-BUNS in my Kitchen TOO!!!!!. Hi Siri... glad u tried this recipe, but tough luck on the buns turning out hard and lumpy :( From what you tell me, I can figure its the yeast that is faulty. If you do not see bubbles in the yeast mixture while proofing, you HAVE to start over as the yeast is not going to work in your buns if you proceed further. This is why the dough did not rise at all. 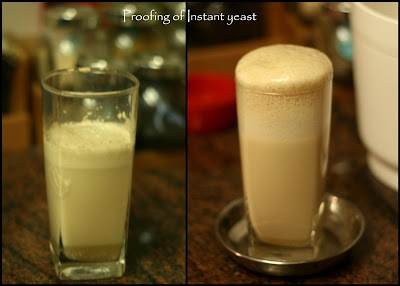 It should ideally double in size within an hour, if the yeast is good. Hi, wld love to try out this recipe...wld it be possible for you to specify the amount of dry and wet ingredients in gms and ml respectively. thnx. I just use the standard measuring cups and spoons MM. If you have the set of standard measuring bowls/spoons... that should do. Yeast Basics: How to Make Yeast Dough?